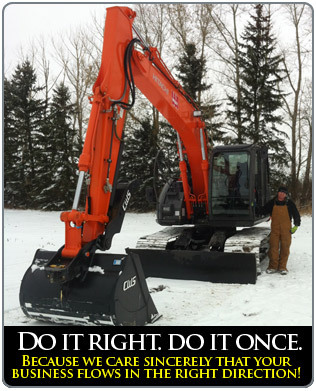 Alberta Septic & Excavating is your trusted source for certified septic systems, and excavating for your development. We have installed over 100 certified septic systems! As certified septic installers with the Alberta Onsite Wastewater Management Association (AOWMA) you can rest assured that we stand behind our work. We have an outstanding reputation for high quality work, professionalism, experience, and knowledge, while offering the best pricing! Our team is well educated and up-to-date with current techniques and best practices. The Septic Systems we design are carefully thought out to meet the needs of your project while respecting the treatment of your wastewater. Call us to book a free onsite consultation or request a free estimate.